to some calming tunes. Perfect day for catching up on school work. to frolic. Qualities a gal like me always looks for in a dress. believe it is in the last one of March. Oh how time flies. PS- What do you all think about my hair pinned back like this? but I just needed a change! Rainy days are the perfect time for relazing and catching up on stuff. I love that necklace, the detail in it is amazing. it was raining here in fla too :( love that dress, and the bag is adorable. your outfits have been really inspiring me lately! Lovely as usual! Can't get enough of your style. Ok this has to be one of the best outfits ever! oh this is such a darling look! You, your hair and your dress are all gorgeous! 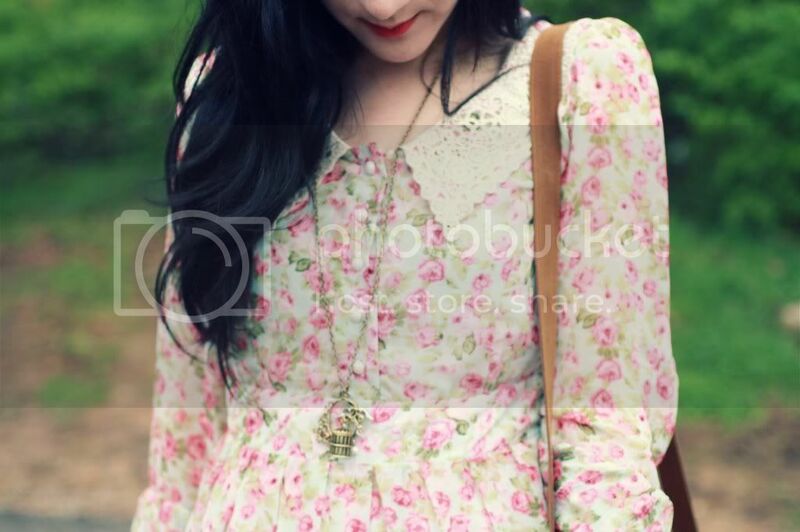 I love pretty floral dresses, they are so perfect for spring! I can't believe March has flown by so fast, summer will be here so soon! Firstly, that dress is so lovely! And your hair looks great, I always feel weird with my bangs clipped to the side as well but you look fabulous. So I'm looking into buying a bag similar to the one you've got in this post, do you find that it's a good size for your day-to-day needs, or is it more like a briefcase or school bag? I'm have a nervous breakdown over what size of bag to get. Part of me wants a huge one like that for my laptop and books and everything, but part of me thinks it's impractical and it'll get too heavy to carry around. What's your experience with big satchels? Help meeee. ps) i have been reading your blog since long and i was sure you had some british roots- because your style is so british :D but somewhere i read that you live in us! So pretty and cute, love it! SO lovely. i'm really diggin the title of this post (: and the picture of your neckalce is so cool!! This dress is lovely! Cute necklace! I like your hair pinned back. you are always so beautiful.. I love that dress so much, especially the collar! Adorable. :) And the bag and necklace annnnddd everything else as usual, haha. And yes, I really like your hair like that! It looks great! that dress is adorable Bonnie! you look so pretty with your hair like that <3 your day sounds so relaxing and perfect! I love your hair pinned back! I think it looks very refreshing. This outfit is perfect. :) And I really like how you pinned your bangs back! They look good both ways but change is always nice. Your hair is great any way you try it! Let your features show! :) Love the outfit! such a sweet outfit. so lovely! fabulous dress and necklace! and I like your hair pinned up like that.. looking fresh! This is gorgeous!! I love the dress, from the color to the print to the pretty collar. Perfect for spring. And I love your hair pinned like that. Ok, so this may be one of my favorites from you ever! Love it. Soo adorable, and I love your hair!! So obsessed with that dress. I love the colors and print! I just checked out the Romwe site and they have some reallyc cool stuff. And I was actually thinking that your hair looked really pretty in these photos before I even read your PS note! Beautiful dress! I want one! :) It looks stunning on you. Definitely checking out Romwe now. Looking like a total doll! 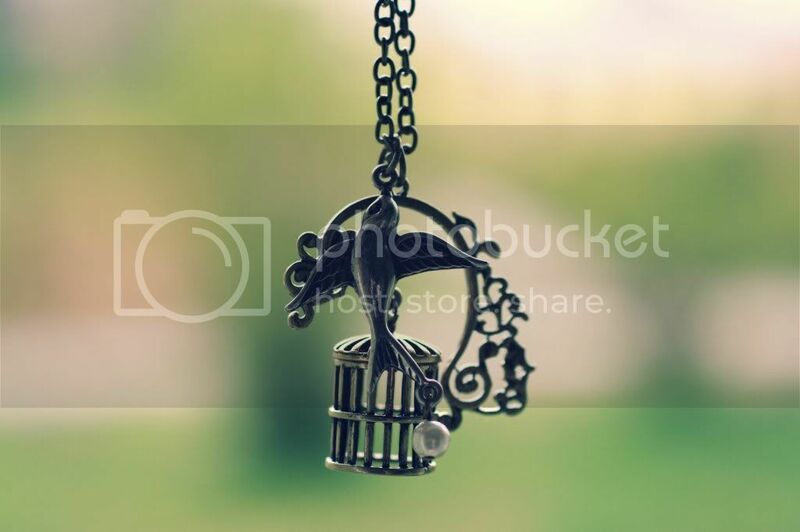 I have a similar bird cage necklace, so cuteee! you look absolutely adorable in that hairstyle. 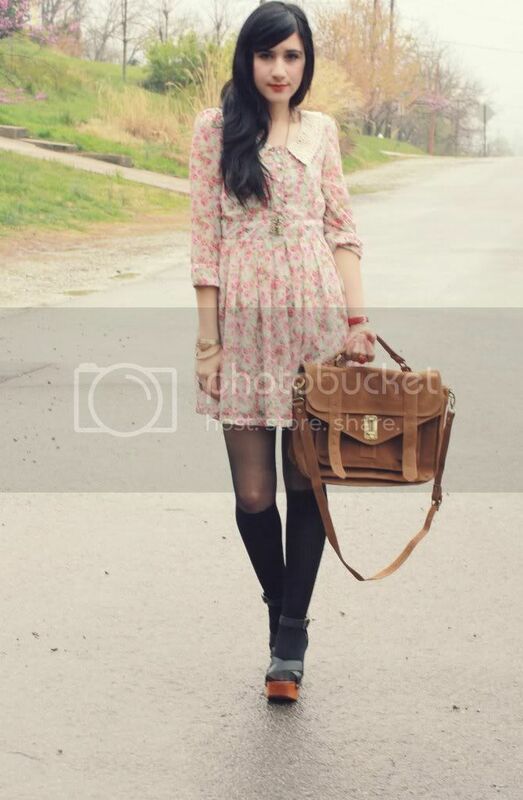 i love your dress and satchel! your hair is beautiful, love it this way. Cute dress! Are this tights and knee highs or only tights witch looks like layering? I've been looking for the JC miracles for ages, they're perfect! those shoes are heavenly. i've been stalking the internet for weeks looking for the perfect ones in my price range. Thanks for the link to Romwe--checking them out now, as that dress of theirs is too cute. This dress is lovely, it really suits you too! i love the hair, i didn't notice it was pinned back but i immediately notice it was better! so, go for it!! love the whole look ! i'm looking for bag like this. You have the most cutest dresses I have never seen! love your outfit. beautiful dress, i like your fringe, looking great today! lovely outfit, especially the shoesies! 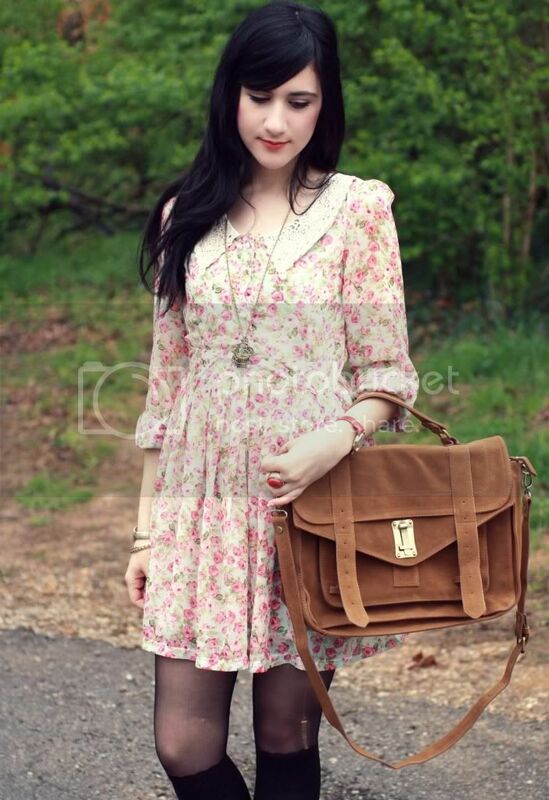 such a romantic dress, and the bag is stunning! You are so cute.You have a great sense of fashion. I can't believge wither that soon April is here.. time does really fly.. Stunning outfit! I love the necklace. Romwe sure have the cutest items! Your dress is so nice. hoping to see you on our blog. The dress is lovely. Wonderful outfit. I haven't been here for so long! As always, you look so gorgeous, and I really love your wedges and skirt! And I think that you look adorable in that hair! I love rainy days but after so many time without sun I really need summer to arrives! Anyway, your dress is really beautiful and I love to see your hair like that! Yr hair looks so lovely this way! Love the collar and print on that dress. You look so nice in this outfit! I think your hair looks really pretty like this! And so does this adorable dress! Love how you styled it with the black overknees! very pretty dress and neckalce! your hair looks lovely pinned back! its weird how such a little thing can seem to change how someone looks completely! we are just a fan of your blog !!! you are always amazing and your style is very cool !!!!! You make a run in your stockings look good. This dress is so cute! So pretty! You look like you've just stepped out of another era! ohhhh very very swetie!! i love the necklace and bag in these pictures your are so beautiful!! !kisses dear. You look different! First thing I noticed. I love this outfit and that dress is just so beautiful. And I'm obsessed with that bag! Where did you find it on Ebay? Your hair looks great pinned back, you should show off your pretty face more often! :) Also I love your purse and bag, too cute. i'm so in love with all your clothes! this dress is also adorable! and i really like your hair in that style, seems so romantic! you have the best dresses, this one is so adorable, love the collar. Oh My!!! this dress is sooooo adorable!! I love the outfit, and the hairstyle looks great on you!